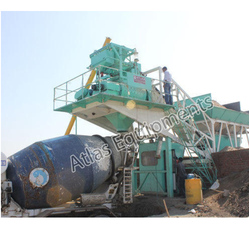 Atlas mobile concrete batching plant is supplied with a twin shaft mixing unit. Full palnt is on a single chassis offering maximum mobility. There are a total 4 aggregate bins for weighing of aggregates. Load cell based weighing for all aggregates, sand, cement, water and additive facilitates accurate results. The concrete mixer comes pre wired from the factory making installation and set up time very quick. Our AMCB series of Mobile Concrete Batch Plant With Twin Shaft Mixer is truly mobile plant built on a single chassis. The aggregate storage is in the form of 4 bins for storage of 4 different materials. There is ne conveyor which does the task of weighing and transfer of weighed aggregates to the twin shaft mixer for mixing. Cement comes from hopper or silo into the weigh hopper and is dispatched to the twin shaft mixer for weighing. Similarly additives are weighed in the weigh hopper. Cement storage can be in hopper or a silo. An inbuilt silo of 18 Tons is also available. Control panel is PLC type and inside a foldable cabin. Packaging Details: Containers / trailer. Looking for Mobile Concrete Batching Plant ?